Jesus Christ said that He would build His Church (Matthew 16:18). Just how was the world prepared for the establishment of the Church of God? The early New Testament Church of God spread across the Roman Empire. God had a plan for when Jesus would be born, and it would be at a time in world history that would be most favorable for His Church to be established. “But when the fullness of the time had come, God sent forth His Son, born of a woman” (Galatians 4:4). Prior to the ministry of Jesus Christ, we read that John the Baptist was to “make ready a people prepared for the Lord” (Luke 1:17). He was also prophesied to “go before the face of the Lord to prepare His ways” (verse 76). So, a people would be prepared, and they were! In fact, a number of John’s disciples, who first accepted his message, later accepted the gospel preached by Jesus. How was the world prepared for the beginning of the Church? In Daniel 2 and 7, we read about four world-ruling empires that would dominate the earth. First there was Babylon, the empire that had taken the Jews captive. In 539 B.C. Babylon was defeated by the Persians, who then dominated the world for about 200 years. It was during this time of Persian rule that the Jews were allowed to go back to Jerusalem (Ezra 1:1-5). In 333 B.C. Alexander the Great established the Greek empire. It was during this time in history that Jews were drawn to cities of learning all over the Grecian empire. They ended up in cities like Alexandria, Egypt. Some scholars estimate that about 1 million Jews lived there during the time of Jesus. Jews also immigrated to Syria, Asia Minor, Carthage, Morocco, Greece, Macedonia, Bulgaria, Armenia, Arabia and Spain (see Acts 2:5, Acts 9-11). Jewish synagogues (Greek for “assemblies”) were raised up in various places where the Jews migrated. A Bible student cannot help but notice how many synagogues Jesus, and later the apostles, visited. Synagogues were ready-made places in which to preach the gospel. Greek ideas and thought permeated the empire. Greece produced a culture that is still with us today. There was an emphasis on literature, language, art and education—especially the lecture style. Greek became the language of the empire and the various schools of learning emphasized it—just as English is emphasized today. This is one reason God preserved the New Testament Scriptures in the Greek language—it was prevalent everywhere. The last of the four empires described in Daniel was Rome. By 60 B.C. Rome had already conquered much of the world. Rome’s was a long-lasting empire that the world would experience for hundreds of years. The first time we read of the Church is in Matthew 16:18. The Greek word for church is ekklesia, meaning “called-out ones.” On the Day of Pentecost in A.D. 31, the Church began and grew in numbers (Acts 2:1, Acts 2:41, Acts 2:47). As time went on, the disciples (members of the Church) were eventually called Christians. “So it was that for a whole year they [Barnabas and Saul, who later was known as Paul] assembled with the church and taught a great many people. And the disciples were first called Christians in Antioch” (Acts 11:26). 1. The spreading out of Judaism: According to Acts 15:21, “Moses has had throughout many generations those who preach him in every city, being read in the synagogues every Sabbath.” The message of God’s laws was quite well known among Jewish populations. Therefore, the gospel message was first preached to the Jews as they had a background in the Scriptures. Afterward the gospel was preached to the gentiles (Romans 1:16). 2. The Hellenization of the East: As noted earlier, the New Testament books were preserved in Greek. On the other hand, even though the Greek culture brought forth a great expansion in education and learning, there were many pagan Greek ideas and philosophies that eventually made their way into Christianity. Paul warned, “Beware lest anyone cheat you through philosophy and empty deceit, according to the tradition of men, according to the basic principles of the world, and not according to Christ” (Colossians 2:8). 3. The religious stance of Rome: The Roman Empire had one set of laws and one leader (Caesar). It actually provided for the safe beginnings of the Church. Roman law protected the accepted religions of their empire—as long as they did not interfere with Roman religion. At first, the Romans did not recognize that Christianity was different from Judaism because the Jews and the Christians kept the Sabbath and biblical holy days. The Romans looked upon early Christianity as just another sect of the Jews (Acts 24:14; Acts 28:22). 4. The rights of Roman citizens: Romans were very concerned for the rights of Roman citizens. Just before Paul’s scheduled scourging, he told the centurion, “Is it lawful for you to scourge a man who is a Roman, and uncondemned?” Once he learned Paul was a citizen, the centurion was afraid (Acts 22:25-29). On another occasion, Paul appealed, as his right allowed, to Caesar (Acts 25:11-12). 5. The excellent Roman facilities and roads: The Roman Empire thrived on the security of international commerce. The Church was able to expand due to the interconnection of towns and villages. 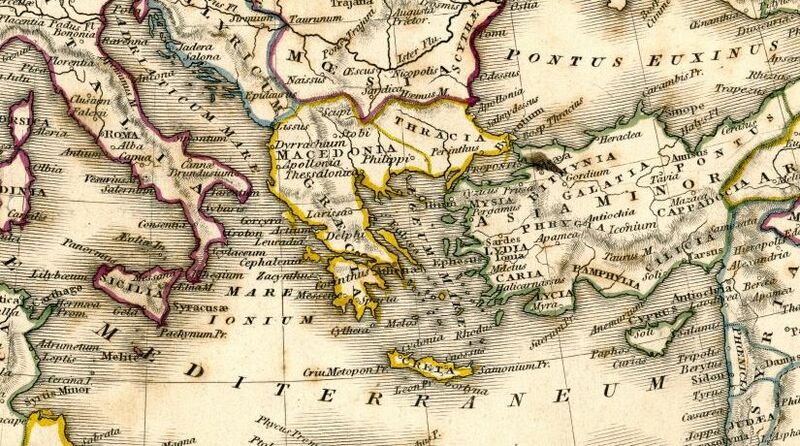 In fact, Paul traveled throughout the areas of Asia Minor and Macedonia with relative ease. We can follow his journeys as they are described in the book of Acts. The epistles and letters written by the apostles could be sent to the members quickly. The book of the Acts of the Apostles tells us more detail of the early years of the Church of God. There was much joy among the members. Miracles were performed, as noted in Acts 3:6-9, which describes the lame man being healed. Great unity and grace was upon them (Acts 4:32-33). The truth about Jesus being the Messiah was taught and the Church had peace. The leaders of the Jews did not like what was happening. They were losing people, and this sect was growing. So they began to imprison the apostles (Acts 5:17-18).When the leaders began plotting to kill the disciples, one of the council members, Gamaliel, intervened and said, “Men of Israel, take heed to yourselves what you intend to do regarding these men. … And now I say to you, keep away from these men and let them alone; for if this plan or this work is of men, it will come to nothing; but if it is of God, you cannot overthrow it—lest you even be found to fight against God” (Acts 5:35, 38-39). The apostles were released and continued their preaching. “Then the word of God spread, and the number of the disciples multiplied greatly in Jerusalem, and a great many of the priests were obedient to the faith” (Acts 6:7). The early Church was obedient to the faith. They believed in keeping the law of God, including the seventh-day Sabbath (Acts 18:4-8). They believed in keeping the biblical festivals (1 Corinthians 5:8). They believed in loving others, which fulfills the law (by not killing or stealing or lying or coveting; see Romans 13:8-10). For many years a congregation of God was in Ephesus, and Jesus made the following remarks about this particular group of people: “I know your works, your labor, your patience, and that you cannot bear those who are evil. … You have persevered and have patience, and have labored for My name’s sake and have not become weary” (Revelation 2:2-3).